The IHA Broadcasting Studio is home to a lot of state of the art equipment. Heart TV is a program that is watched by the entire student population at Immaculate Heart Academy every day. There are many different segments on the student-run show that cover a wide variety of topics. Every morning at IHA, Heart TV informs students on daily and local news, upcoming birthdays, and delivers school-related announcements. IHA students live broadcast the show in the television/broadcasting studio. The studio has an editing suite with professional equipment comprised of cameras, a lighting grid, a switcher, and an audio board. 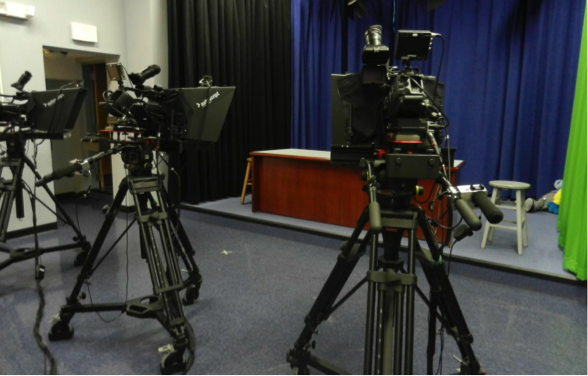 Not only is this studio available for students that participate in Heart TV, it is also open to those students taking classes in Broadcasting and Video Production who can explore their interests here as well. Heart TV is actually a club that students interested in broadcast journalism can sign up for. The moderator of Heart TV is Mrs. Jessica Shaheen, who is currently out on maternity leave, and is being temporarily replaced by Mrs. Lorraine Mongelli. The President of Heart TV is Simona Riccardi’17, aided by Vice President Grace Dury’17. Simona Riccardi’17 has been working in the program ever since she was a freshman and loves it. She believes she has been given a great opportunity to do this at a high school level. Riccardi’17 believes the program is as advanced as some college programs and that the club is not intimidating at all– it is actually a lot of fun! She says, “It’s important that with a show with as many parts as ours that everyone feels comfortable and competent.” She enjoys putting together the show for everyone at IHA to watch. Overall, Heart TV is a great program that lets students explore their opportunities in working in a real studio and interacting with other students that have the same interests as they do. Make sure to sign up for this fun activity and possibly find a new passion!